Gaby’s thoughts: My Monday nights are back. While Gossip Girl may not be Emmy material, it’s hard not to feel drawn into the drama of the Upper East Side. Gossip Girl has a charm about it. Yeah, its plotlines are unrealistic and a bit ridiculous at times, but we all keep coming back for more. The first episode of Season 5 premiered last night. The first episodes aren’t always the greatest. There’s a lot of setup and explanation of what the main characters did all summer. Blair spent the summer with her fiancé Louis, a prince of Monaco. Blair’s main dilemma in this episode is Louis always siding with his mother. We watch as Blair tries to take back control of her wedding. Blair is my favorite character, but her role in this episode didn’t do much for me, especially the ending which I’ll mention later. Almost immediately in the episode, Dan finds out that a part of his story was published in Vanity Fair. As we know from last season, Vanessa had sold his book about the Upper East Side to a publisher. Dan calls in Louis to help bring down the excerpt because it may end up hurting Blair in the end. On the west coast, Serena has been working as a PA on a David O. Russell movie. The director makes another character, which I still don’t get, but hey, why should I complain? Serena’s role as a PA is ridiculously over-glamorized, but what part of Serena’s life isn’t? Nate and Chuck join her on the West Coast. Nate is, as usual, looking for himself, and that journey leads him to hooking up with a rich LA older woman (played by Elizabeth Hurley). Chuck is becoming a daredevil in a way to deal with his pain of letting Blair go. However, most of the episode was eclipsed by a few key scenes. The first was a moment between Dan and Blair. It’s revealed that Dan is in love with Blair, and she’s not aware of that at all. 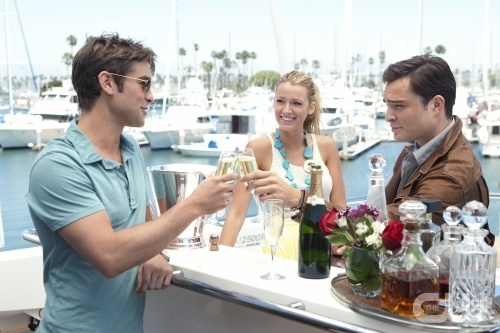 Another scene between Dan and Rufus reveals a hint of something new, that something actually happened between Dan and Blair. Dan says to his dad, “Did you read it all the way to the end?” Rufus replies “Yes. Wait… did that really happen?” Dan backtracks, citing that it may be artistic license. His story was about Blair, so what is that thing that happened at the end?? Did they… or didn’t they? All this mystery leans toward the affirmative. Finally, while Blair is being fitted in her wedding dress, her seamstress asks Blair how far along she is. That pregnancy test may not have been Serena’s or Blair’s (it was Dorota’s), but hey it looks like Blair may have a bun in the oven. Whose bun may that be? We have three candidates: Dan, Chuck and Louis. We can debate who the father is all day, and this plotline will probably be dragged over several episodes. My main issue is that my favorite character got knocked up! Yes, let’s impregnate the one smart, ambitious woman of the show. Getting Serena knocked up would’ve made more sense because the girl is so clueless; it would be no surprise. Why Blair? Why eclipse her future in such a way? It is so annoying. I have no idea where the writers are going to take this once the baby daddy mystery is solved. This dramatic turn in the story has taken it too far. What I always loved about Gossip Girl was that it was dramatic but never took itself seriously. It makes quips about pop culture and itself throughout the dialogue. That’s what made it so entertaining. It’s a guilty pleasure, but it was one of the smarter ones. Now, I’m afraid to see where it’s headed. I’ll still watch the show because it will take more than a dumb storyline to make me lose interest. I’m a diehard Gossip Girl fan. I ship Chair, despise Dair, and always have an eyeroll ready for Serena. I can’t let these things go too easily. Hence, as a true fan, I am with my favorite Upper East Siders until the end. I decided to do a video review/recap of the episode. Let me know what you think!